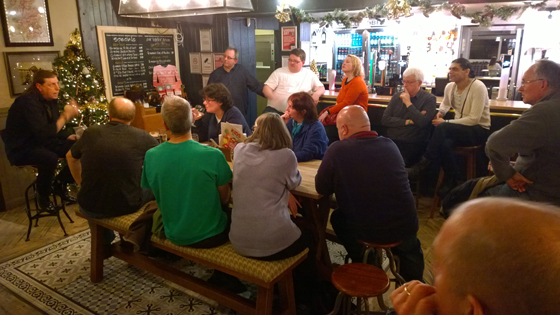 On 17 Nov 2015, Jason Baird addressed a meeting of Yes Edinburgh West in the Clermiston Inn, to pitch his concept of a grassroots network of Yes groups, which he has given the working title of the National Yes Registry. His ideas were accepted very positively and two delegates from our group (Anne Donohoe and Bob Glen) were elected to attend a conference in Largs on Sat 5 December 2015. In between the pitch and discussion we were entertained by the Indy Choir – you can hear their wonderful harmonies in the following video clips.